Phillies first baseman Carlos Santana celebrates his second-inning three run home run with teammate Odubel Herrera against the San Diego Padres on Friday. It took just 14 pitches in Friday night's 11-5 win over the Padres for the Phillies to hear their first boos of the second half. It was the first time since 2011 that the Phils played a game after the all-star break atop the National League East. And the night could not have started any worse. Jorge Alfaro threw a ball into center field, Carlos Santana dropped a pickoff throw, Odubel Herrera misplayed a liner, and Jake Arrieta looked flat as the Padres scored four first-inning runs. But as quickly as it unraveled, it was forgotten. The Phillies moved on. 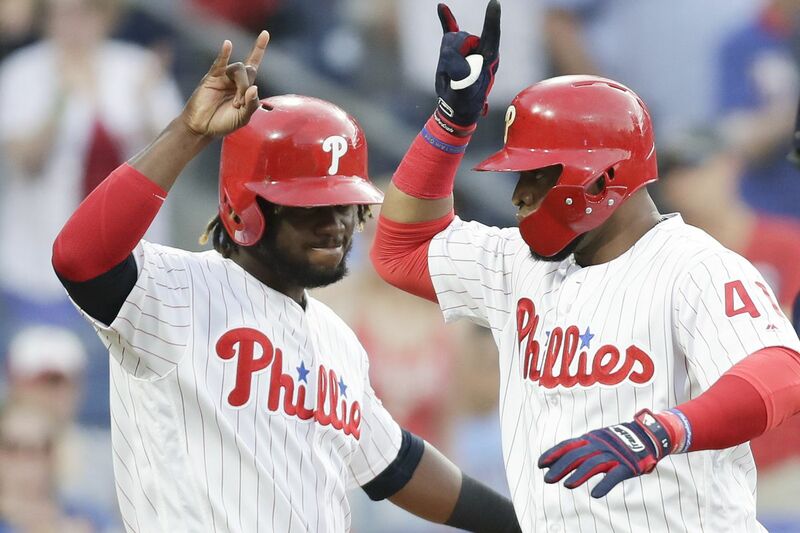 They scored six two-out runs in the second inning, silenced the boos at Citizens Bank Park, and opened the second half with a win to stay in first place. If there was ever an ideal Phillies inning, it was their rally in the second. The Phillies walked three times, including one by Rhys Hoskins with the bases loaded. The offense is built on seeing pitches, working deep counts, reaching base, and then waiting for the extra-bases. They regularly worked deep counts in the first half, saw more pitches than any other team, and walked the third-most times in baseball. But extra-base hits were few and far between. The Phils ranked seventh-to-last in both slugging percentage and extra-base-hit percentage. The offensive philosophy seemed to be imperfect. But the Phillies stayed committed. General manager Matt Klentak said before Friday's game that "we like to take pitches, work at-bats, take walks, and grind the opposing pitcher down." A four-day all-star break did not cause them to suddenly shift their beliefs. This lineup, the Phillies believe, can hit for power. And after they worked their walks on Friday night, it did. Santana clubbed a three-run homer to center to cap a six-run inning. Manager Gabe Kapler favors the term "Phillie-style at-bats" for a long plate appearance that makes the pitcher work. Well, this was a "Phillie-style inning." They walked, filled the bases, and emptied them with an extra-base hit. "Especially over the course of the last month or so, we were looking for that moment. That big hit," Kapler said. "So we were getting guys on base and we just weren't quite able to capitalize. So, yeah, that was incredibly encouraging to see Santana clear the bases like that." The Phillies averaged just 4.33 runs per game in the first half and were the only division leader to finish below the league average. A rate that low will likely not be enough if the Phillies are to reach the playoffs, especially when factoring in a likely regression — even a slight one — by a pitching staff that carried the team for the first half. Friday was a move in the right direction. Cesar Hernandez and Herrera each drove in two runs. Santana had four RBIs and Scott Kingery had two hits. The Phillies, playing for the first time since they failed to acquire Manny Machado, produced. "Would it have been cool to have a guy like that? Yeah," Arrieta said. "On the flip side of it, it gives other guys more opportunity to show they can produce at a high level and help us continue the way we've been playing…We've obviously gotten into the position we're at with the guys we have. I don't see any reason why we can't continue to have contributions from guys top to bottom throughout our roster because we've gotten this far with the guys we have." Any offensive uptick will mask any regression by the pitchers, which is what was needed Friday. Arrieta lasted just 31/3 innings. He allowed five runs, four of which were earned. He was pulled after 82 pitches, just 42 of which were strikes. It was a night when a six-run inning was needed. Kapler used five relievers to piece together the final 17 outs. Austin Davis picked up the first five outs to earn his first major-league win. He showed poise by stranding the bases loaded in the fourth. But before Arrieta exited, he helped change the game with his feet. He appeared to ground into a double-play ball to end the second inning, but he charged down the line to beat the throw at first. The inning continued and a six-run rally was about to begin. Those boos – like the four-run deficit the Phillies faced – were erased. "Getting down the line is just something I have to do," Arrieta said. "There's no way I'm going to allow a double play there. Those little things happen all around this roster, this clubhouse. That's a big reason why we are where we are."